Aaron has been involved in the museum’s education initiatives for most of his life, spending summers in the basement classrooms as a child, becoming an instructor at the Art School in 2003, and rising through the ranks to his current position—head of our recently restructured and renamed Education Department. 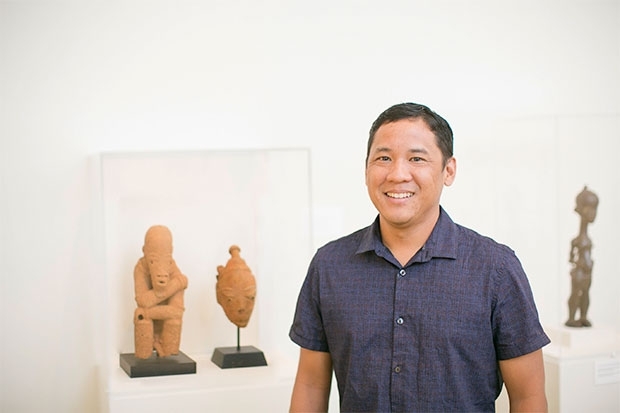 When asked to share his favorite piece in the museum, he stops in front of a case holding Kneeling Figure and Head—two hand-built and carved terra cotta pieces made by the Nok people in what is now Nigeria between the 5th and 4th centuries BC. In addition to his work as an educator, Aaron is also an accomplished painter, ceramist, and sculptor. His work can be found in the Halekulani Hotel, the Fendi Foundation for Design, and the Hawai‘i State Capitol, as well as many other private collections. This story resonates with me. I saw the figures, your work, you, the Nok, as parts of a ever widening connected spiral. I know I’m on hat spiral too, and this story makes me feel connected to the efforts people have made over time. There are so many steps along the spiral here- your life and the entire overlapping life of everyone that’s ever been, with art as markers. Loved your selections and comments, Aaron. You so aptly emphasize the indelible influence of art with these pieces.